Is Your Lawn Suffering From Dry Patches? 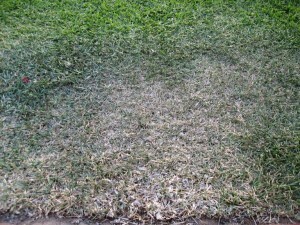 Perth’s harsh summer can cause your lawn to dry out almost to the stage where there is no return. Don’t despair. The team at Superior Lawns; Perth’s premium roll on lawn suppliers know how to bring back your lawn, and it won’t cost you an arm or a leg! If you notice dry patches in your lawn, generally speaking it could be one of five things. They can occur individually, or as an interrelation between two or more of them. The reasons have been listed in order of priority. 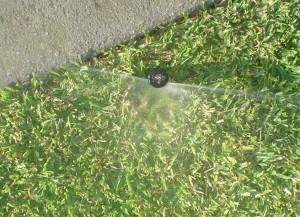 Hydrophobic soils repel water and this doesn’t allow for even distribution of water. The water makes runnels, following down through easier penetration areas, over wetting some areas and completely missing others. This is a natural occurrence in our dry, waxy sandy soils. So, if your retic system is working efficiently and you are still having problems with a dry lawn, use a spade to cut out a square of lawn 100mm deep from the stressed area. You can then compare it with an area of healthy lawn. If it is drier, you probably have hydrophobic soil (at the same time you can check for beetles and grubs). Applying a good quality wetting agent such as Bailey’s Gro Sorb, Soil Soak, Ezi-Wet or Aqua Soak before the first heat wave and reapplying as required (we recommend 4-6 weekly in summer) will improve and even out the water penetration through your lawn. Lawn should be fertilised lightly every 6 to 8 weeks with a quality fertiliser such as Sir Walter Buffalo Fertiliser or Baileys 3.1.1 or 4.1.1. This should continue even into winter to keep your lawn green and vigorous when others have gone dormant. A tonic of iron, manganese and nitrogen sprayed on the leaf does wonders. This is available at Bunnings. It is important that your lawn is mowed at a suitable height (above 20mm and higher in shade). This helps the lawn to keep its vigor and minimises porpoising (when the runners leap over each other due to the lawn being scalped). Scalping also stresses the lawn as it doesn’t have as much surface area in the leaf to retain moisture and promote photosynthesis and it is a known fact that the length of the leaf has a direct relationship to the length of the roots (longer roots make the lawn more drought tolerant). Finally spills including fertiliser, chlorine, petrol or BBQ fat will damage the lawn. Other secondary problems can be excessive thatch, dog urine and builders slurry (lime and mortar washed out of concrete mixers etc during building). Also, all lawns have a flowering and seeding time. Buffalo lawns flower in late spring and can occur more often in a new or stressed lawn. Any problems can be minimised (or even eliminated) by checking the above points and you should be well on the way to having the best lawn in the street. So if your lawn isn’t look its usual lush self give one of the above a go and see how the difference. For more information on roll on lawns available in Perth give the team a call today 9303 2627.